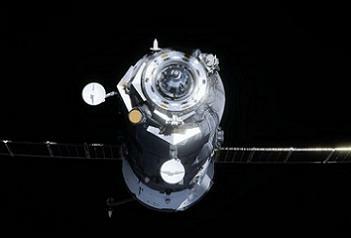 The uncrewed Russian Progress M-14M resupply spacecraft, also going by its US designation of 46P, has successfully docked with the International Space Station (ISS) on Saturday morning (GMT). Ahead of the M-14M events, the recently undocked Progress M-13M/45P performed the unusual procedure of deploying a microsatellite into space prior to de-orbiting. Progress M-14M/46P was the first launch to the ISS in 2012, following its Wednesday, 11:06 PM GMT launch from the Baikonur Cosmodrome in Kazakhstan. 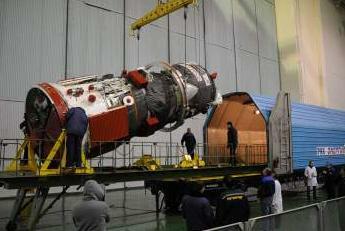 For this year, ISS managers are hoping will see better successes for Russian rockets than 2011 did. Progress M-14M was only the second Progress to launch to the ISS since the failure of Progress M-12M/44P last August. While one successful Progress and two successful Soyuz spacecraft have launched to the ISS since that failure, the 23rd December failure of the Meridian satellite atop a Soyuz 2-1b booster raised further questions about quality control of Soyuz rockets, as much as the Soyuz 2-1b uses an RD-0124 third stage engine, while the Soyuz-U to be used on the launch uses the older RD-0110 on its third stage. Both engines are believed to have been the cause of the failure of their respective boosters to reach orbit last year. Progress M-14M kicks off the year of logistics resupplies to the ISS by delivering its standard load of propellants, oxygen, spare parts, experiments, water, food, clothing, and other crew provisions to the orbiting Expedition 30 crew. This year is set to be a very challenging year for ISS logistics, due to the aforementioned problems with Russian rockets, last year’s retirement of the Space Shuttle, and the need to demonstrate and bring online a commercial resupply capability for the station, the schedules for which continue to slip to the right. Following launch at 11:06 PM GMT and a two-day free-flight, Progress M-14M dock to the ISS at the recently vacated Docking Compartment-1 (DC-1) “Pirs” Nadir port on Saturday 28th January at 12:09 AM GMT (Friday 27th US time). Progress M-14M will remain docked to the ISS for around three months until 24th April, whereupon it will undock to make way for Progress M-15M/47P, set to launch the following day on 25th April. Progress M-16M/48P, Progress M-17M/49P and Progress M-18M/50P are also set to launch to the ISS this year on 25th July, 23rd October and 26th December, respectively, for a total of five Progress launches in 2012. The next vehicle to launch and dock to the ISS after Progress M-14M however will be Europe’s Automated Transfer Vehicle-3 (ATV-3), currently set for launch on 9th March for a docking ten days later on 19th March. In order to clear the way for Progress M-14M to dock to the ISS at the DC-1 port on Friday, Progress M-13M/45P was undocked from DC-1 on Monday, having been docked there since 2nd November following its 30th October launch atop the first Soyuz booster since the August failure. Following undocking and two separation burns, instead of de-orbiting into the Pacific Ocean, Progress M-13M instead performed another two burns to raise its orbital height from the roughly 400km mean altitude of the ISS up to 500km. This was done in order to facilitate the deployment of the Chibis-M microsatellite from Progress M-13M. 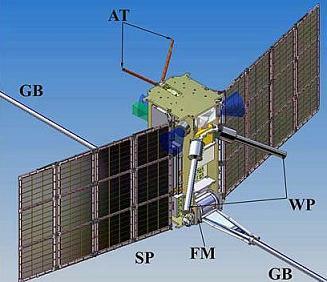 Chibis-M is a free-flying small Russian satellite which is designed to study lightning and plasma in Earth’s atmosphere for 3.5 years. Eventually, Chibis-M will succumb to atmospheric resistance and resulting altitude decay, and re-enter Earth’s atmosphere. The deployment at 500km as opposed to 400km will buy Chibis-M some extra time on-orbit due to the lesser atmospheric resistance at that altitude, however the specific re-entry period will depend on Solar activity, which can “swell” Earth’s atmosphere in active periods. While designed to operate for 3.5 years, the expected on-orbit lifetime of Chibis-M is anywhere from 4 to 11 years, depending on Solar activity, which is likely to increase in coming years due to the Solar Maximum. The earliest that Chibis-M could reach the ISS’ altitude of approximately 400km is three years after deployment, which would be January 2015. This date, however, depends on Solar activity. The risks associated with having Chibis-M “drop” onto the ISS’ orbit have been analysed by both Russian and US trajectory experts. Once Progress M-13M trash loading operations were completed, the crew of the ISS prepared Chibis-M, which launched aboard Progress M-13M inside its pressurised cargo compartment, for deployment. Chibis-M still resided inside the cargo compartment of Progress M-13M when it undocked, but it was mounted in alignment with the open hatchway of the compartment so that it could be deployed via springs through the open hatchway leading to space. Due to the need for an open hatch of the Progress M-13M cargo compartment during and following undocking, after mounting of Chibis-M in the correct location and closure of the hatch on the ISS side, the Progress M-13M cargo compartment was depressurised to vacuum by the ISS crew, an unusual procedure which meant that all trash to be disposed of in the compartment needed to be certified for vacuum. One orbit after deploying Chibis-M, Progress M-13M performed a de-orbit burn for a re-entry and splashdown over the Pacific Ocean, completing its successful mission.